We usually take our kids Easter egg hunting every year and this year was no different. 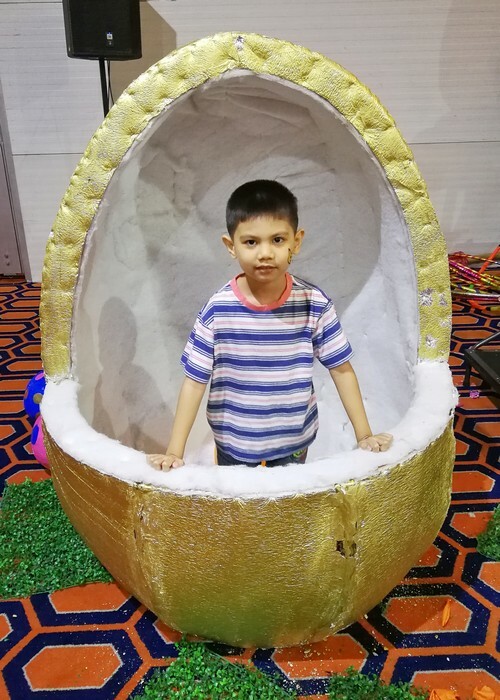 I started browsing for places to go early in March and we initially planned on taking our two boys to the Easter event at Fun Ranch Alabang. However, we weren’t able to go there to book tickets early. Lo and behold, on the day before Easter, I saw an announcement on their Facebook page saying that tickets were already sold out. 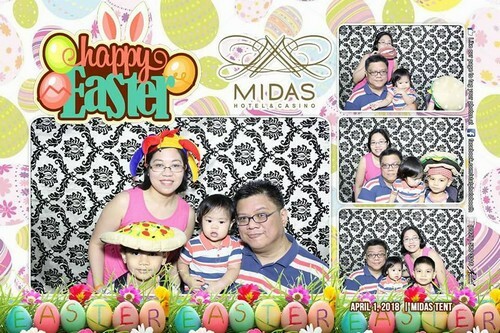 Luckily, I still had my list of Easter events and hubby and I decided to just take the kids to the one at Midas Hotel and Casino. We’ve never attended their Easter events before. But we were able to attend a brunch event there a few years ago and we were also able to go on a staycation there. We had pleasant experiences during both times so we figured the Easter event would be nice as well. 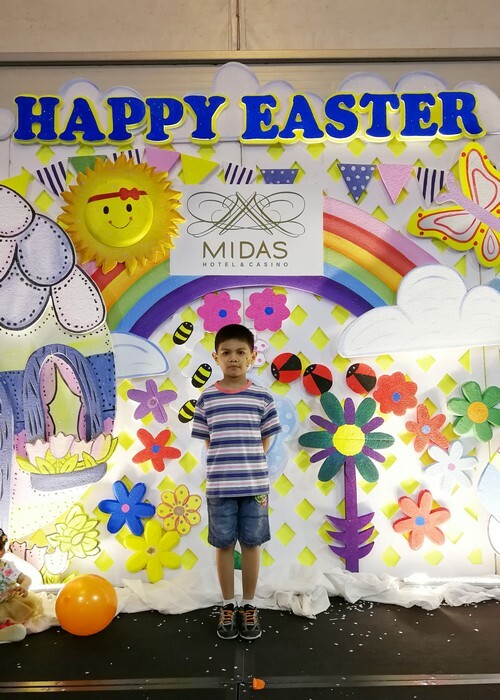 So, off we went to Midas early on Sunday morning. I immediately went to the lobby to ask if tickets were still available. Luckily, they were and so I bought two. Each ticket cost Php 500, good for one child and one adult already. It included access to all the activities and games, plus free snacks for the kids. Take note though that the event was held at the Midas Tent, which before then we didn’t know was at the very back of the hotel. We had to take the elevator down to the basement, walk through a long hallway and go up a flight of stairs before reaching the venue. If we knew that, we wouldn’t have brought our stroller anymore. Anyway, here’s Ziggy at the stage. It was nicely decorated for the event. We also took a picture of him inside the Golden Egg. We wanted to take a photo of Zander in there as well but he was taking a nap that time. Sayang! I wasn’t able to take photos of the food stalls but there were a number of them inside the venue. There were stalls selling hotdogs, French Fries, cotton candy, corn, sandwiches, and drinks. As expected, the prices were pretty high considering it’s from a hotel. By the way, the free snacks given to the kids were just one stick of corndog each and a tetra pack juice. Food-wise, we were not really happy with what they had but they kept us from getting hungry so it was fine. 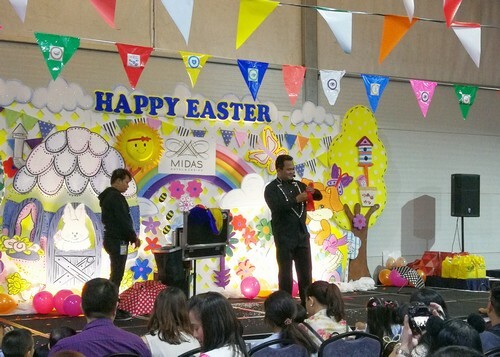 There were activities on stage, which included a magic show…. 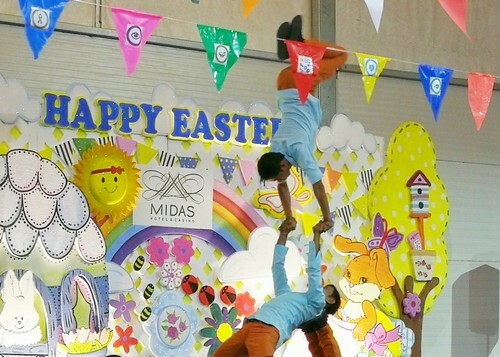 ….. an amazing acrobatic show. This was my favorite part. It’s just too bad I wasn’t able to take a lot of photos…. ….. plus some games for the kids and their parents. There was also a raffle but we didn’t win any of them. The side activities included egg painting, which we didn’t get to do. But Ziggy was able to do the cookie decorating …. 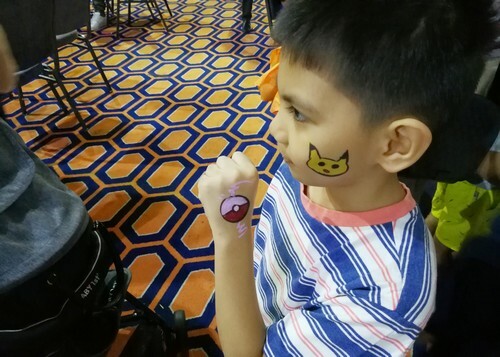 ….. and the face painting. There was also a photo booth, which was actually the first one we went to because there was no line yet when we entered. We were able to take two sets of photos because we had two tickets. The last activity was the actual Easter egg hunting. Unfortunately, we didn’t realize it was about to happen already. By the time we realized it, a huge pack of parents and kids were already crowding the entrance of the egg hunting area. When we finally got there, everyone had started going inside already and we came out with nothing. As in, no more eggs! And we weren’t the only ones. Needless to say, a lot of kids were disappointed. I wasn’t even able to take photos. Plus, the egg hunting area wasn’t very well-lit too. Let me tell you, the Midas Tent was packed with people. The staff had to keep adding more and more chairs because people kept coming. It eventually became a challenge going around the tent. It was mentioned that they didn’t expect this much people this year and I guess that’s why they were unprepared. The good thing was, I saw some of the staff come out with boxes of eggs and started giving them away to the kids. Luckily, hubby and Ziggy were just near one of them and I immediately called their attention to the staff giving away the eggs. So, Ziggy eventually got some. If he didn’t, I would’ve been really disappointed too. Overall, our family did enjoy the event although there were obvious hits and misses. I love that their ticket price was a lot cheaper compared to the other hotels. I like that the tickets had stubs to claim the snacks, the photo booth slots and the face painting slots. I just hope that next time they’ll serve better food choices and that they limit the number of guests so that people will not get stressed just trying to find seats. Their activities were enjoyable. 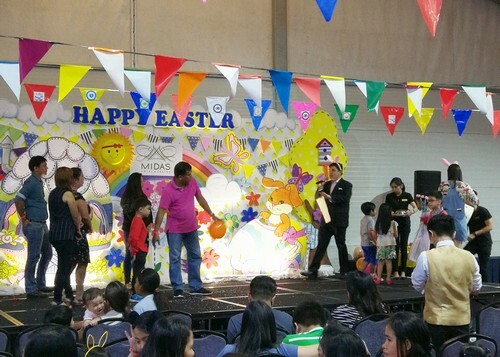 I just wish that they focused more on the egg hunt than on the other activities though because that’s what kids look forward to the most during these Easter activities anyway. Would we go back if they organize an Easter event again next year? We’d like to give it another chance. For sure, once they improve on their “misses” their events will be more enjoyable for their guests. I love Easter egg hunts. This one sounded like a big event. My boys would have loved the cookie decorating. Oh wow what an amazing looking celebration of Easter this is. Such a great array of decorations as well and things going on for all! Absolutely perfect event for kids. Congrats on doing such a good job! It had to very time consuming. Sounds like such a fun place to spend Easter. I do agree though that the egg hunt should have been a bigger focus! What a fun easter celebration! Looks like one to remember! Looks like you guys had an amazing time as a family. I think my kids would have loved all that. Happy Easter!! 🐣 This looks like such a fun event. I am sure that this would brighten my hildrens day to spend Easter egg hunting with their peers! Looks like such a great time! I hope you guys had an amazing Easter. Well, this looks like a fun way to celebrate Easter and enjoy the holiday festivities with the Easter bunny!! Hope you and your family have a wonderful rest of your spring season! I agree with you. They should have thought of limiting tickets sold, so they could have given the crowd better if not the best experience. I attended a Trick or Treat event in one hotel and same as your experience, ang dami tao and nagkakaubusan pa ng loot bag and food. I really hope that they will limit the number of guests para naman maenjoy. 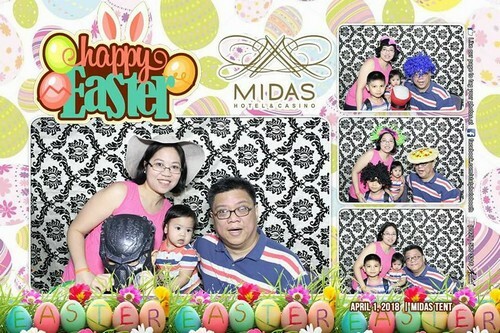 We experienced Easter Egg Hunting event at Vivere Hotel and mas konti tao dun so naenjoy namin. This looks like fun for the entire family. I love how they had crafts for the kids and options for photo opportunities at the photo booths. I think that you were way too amazed at the acrobat show that you couldn’t take a lot of pictures. lol Jokes aside. It sounded like an eventful day. It looks like you had a lot of fun and that there was a lot to do, a great way to spend Easter in fact. Ay yes, I totally agree. I think that if you host an Easter Egg event, the hunting is the most important one kasi yun ang ipinunta dun. 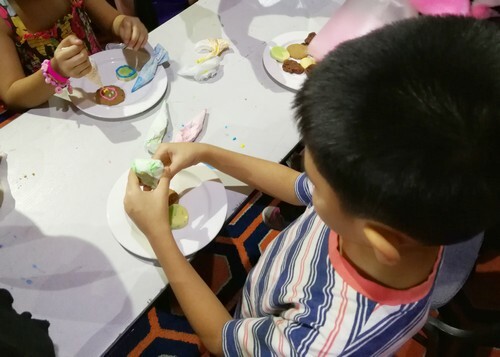 We have not taken our kids to any Easter egg hunt event yet…Kids Church in Victory Fort usually add more activities and fun things to do for kids during the kids services on Easter Sundays, and that’s where our kids usually are. They don’t have Easter egg hunts, though, I think. Sounds a lot of fun but I don’t like that it’s too crowded especially with kids pa. For sure my son would enjoy the Magic and Acrobatic show, nakakaamaze kasing panoorin. I love everything about in this event. I’m sure your kid and your family enjoying this event galing din ng mga activities nila ano? family bonding narin.